Kief— most tokers have a small collection of these coveted resin glands sitting in their grinder (especially if said grinder comes with a ‘pollinator’ or ‘kief catcher’) but it often goes unsmoked due in part to how difficult it is to handle. Even when kief does get smoked, its often wasted as the fine powder gets sucked through the bowl or joint without being heated. This problem is what inspired the most ancient form of hash making as cultivators learned to heat and press this kief into bricks of hashish. Fast-forward several hundred years and we’re still using similar methods to turn kief into easier-to-handle hash via a device that’s known as a “pollen press.” A pollen press is essentially a vice that compresses “pollen” (aka kief) into pucks of hash (not unlike how a ‘pill press’ is used to form pills). In 2015, there are an abundance of different commercial pollen presses online for as little $10 but if you aren’t generating enough kief to warrant buying a pollen press of your very own, that doesn’t mean you can’t press your own hash! We’ve compiled three DIY methods to turn your kief into hash so you don’t have to keep watching your hard-earned stash get wasted! 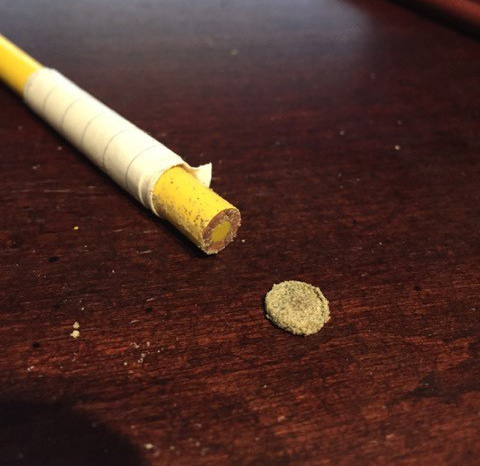 This is the method you’ll hear from the real weed veterans and hippies— fold the kief into a piece of wax or parchment paper and stick it in the heel of your shoe. As you walk around, the heat and pressure from your foot will press the kief into a nice little slab of shoe hash! This method works wonders if you don’t mind your shoes smelling like hash / your hash smelling like feet (pro tip: use clean shoes and socks!). Step 1: Cut the paper so its no bigger than 2”x2” and make sure the ends of your unsharpened pencils are as flat and clean as possible. Step 2: Wrap the paper around one of the pencils as tightly as possible and tape the paper to itself so it remains wrapped around the pencil. 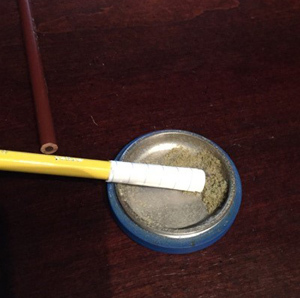 Step 3: Slide this paper cylinder half-way off the flat end of the pencil it’s wrapped around and scoop kief into the newly formed chamber. Step 4: Insert the flat end of the other pencil into the open side of the cylinder and apply steady pressure using a table to anchor one end of the pencil-cylinder-pencil setup for 10-20 seconds. 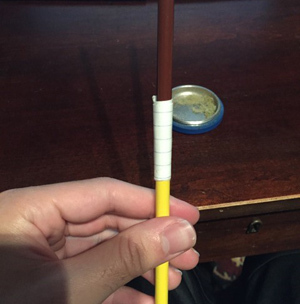 Step 5: Stop applying pressure, remove one pencil and slide the cylinder down the body of the other pencil, you should have a small disk of pressed kief sitting on the top! Peel off and enjoy. 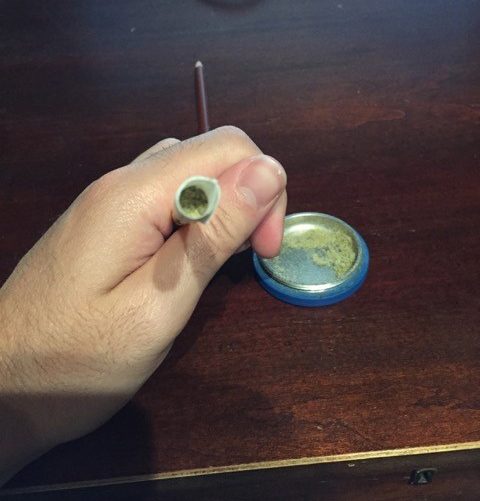 With dabs having taken over the hash-smoking world, its often desirable to have a hash that can be consumed using a nail or similar smoking implement. In this case, pollen needs to be both pressed and heated so that resin can be released from the trichome heads into a sappier, dabbable product. Though careful temperature control is critical for obtaining a product high in terpenes, the process is as simple as using a hair straightener to heat and press some kief (or bud) in between a piece of parchment paper. That’s it! You’ll see the rosin begin to form as a golden sap on the inside of the paper. Don’t let that kief go to waste! If you don’t feel like spending the money on a pollen press, be sure to use of these methods to convert that stash into sweet, sweet hash! We’ve all seen the news stories about how dangerous dabbing can be — dramatic accounts of clandestine “drug labs” being blown up by amateur hash-makers– but really, how dangerous is dabbing for the average user? Though there’s been little formal scientific research specifically on the topic (due mostly to the DEA’s listing of marijuana as as schedule 1 substance), empirical data suggests that under ideal conditions, dabbing should pose even fewer health risks than traditional combustion of marijuana. The key to understanding dabbing is to realize it’s just a contemporary form of “hot knife” vaporization– a stainless steel (or ceramic or quartz) surface is heated directly and that surface is used to vaporize hash oil below the ~450°F required for actual combustion (remember THC vaporizes around 300°F)– flame is never applied directly to the hash oil. As a result, the vapor contains mostly water and cannabinoids rather than the mix of tar and potentially dangerous aromatic hydrocarbons contained within smoke. It’s been well established: vaporizing is much healthier than actual smoking. Of course, certain dabbing rigs can present different safety challenges… propane and butane torches require compressed gas which always requires proper storage and safety to avoid explosion. E-nails can also be hazardous if left on and forgotten and knocked over– though they require about as much precaution as a waffle iron. Now that we’ve established that vaporization is less harmful than combustion, its important to consider what exactly you’re vaporizing. Under ideal conditions, your concentrate will be butane-extracted and the solvent purged below the 3ppm taste threshold (though CO2 and pressure-extracted concentrates offer similarly healthy but less potent alternatives). Butane is relatively non-toxic and is often used as a preservative in the food industry. Under such circumstances, concentrates are composed mainly of plant resin and offer the purest form of cannabinoids available on the market. Very high quality concentrates are also able to capture volatile terpenes stored within the cannabis plant which provide “entourage medicinal effects” and contribute to a concentrate’s flavor. Of course, dabbing poorly-made concentrate can be just as detrimental to your health as smoking. Amateurs chemists like professional janitor Rick Simpson have become famous for perpetuating “light naptha-based” concentrates, solvents which are not available commercially without severe adulteration of highly toxic chemicals. These solvents are absolutely not safe for use with any product intended for human consumption and concentrates made this way present a serious threat to both the health of patients and the legitimacy of marijuana as medicine. Negative Health Effects from THC? Despite the greatly elevated levels of THC in concentrates, there has still yet to be a single case of marijuana overdose in the history of time (and believe me, some folks are out there trying). Still, there are certain hazards to consider with such elevated concentrations of THC. Such high levels of THC can quickly lead to increased tolerance, dependence, and more pronounced withdrawal effects upon cessation of marijuana. Some people can also be overwhelmed by the strength of a dab, causing a marijuana-induced panic attack. While there appears to be no significant long-term effects from smoking marijuana or its concentrates, more research is needed to fully understand the long-term physical and mental impacts it has on human beings. Until the federal government is willing to clear the way for researchers to do what they do best, we may never have a clear understanding of how marijuana affects our health in the long-run. Still, it would appear that dabbing presents no significant health risks and may provide a healthier alternative to traditional combustion of marijuana. As states being to legislate their own rules regarding marijuana, we’ll likely see this topic appear more and more– hopefully that will drive the government to reconsider its position so a serious long-term study can be performed. Though there had been many attempts before, it wasn’t until a few years ago that we began to see truly portable, efficient dry-herb vaporizers make their way on to the market (thanks to a wider availability of lithium-ion batteries). Products like the Pax the Mighty (made by the same makers as the Volcano) and the Magic Flight Box have proven to be popular solutions for people looking to take vapor hits on the go. Both the Pax and the Mighty offer similar, high quality experiences but the Mighty offers a full-convection experience (only hot air comes in contact with the herb) making it bulkier. With the popularity of convection vaporizers like the Volcano, it was only a matter of time before people become concerned with how airflow affected vapor flavor and strength. The electronics inside vaporizers (especially cheaper, Chinese-made models) let off small amounts of potentially toxic gas as the resins used for manufacture heat-up and degrade. Though most vaporizer companies ignore this in their design, the company 7th Floor from Colorado makes their vaporizers with heating element completely isolated from the electronics offering the cleanest, most efficient airflow possible. Da Budda and Silver Surfer vapes are each made 100% in the U.S.A., can be custom designed, and feature a little hand-blown glass art making each one of a kind. They have a unit that’s been running constantly for almost 6 years that’s still going strong. We know terpenes and other volatile compounds in cannabis have beneficial medicinal entourage effects so it’s only natural that a vaporizer would directly address a way to obtain the maximum benefits from these compounds. Many people set their vaporizers to a single temperature but in order to coax out the maximum number of terpenes without damaging them, it requires a dynamic range of temperatures… enter the Firefly. This vape uses a unique ‘dynamic convection’ heating system allowing the user to experience a full profile of volatiles through slow, controlled heating. Not unlike performing a “frequency sweep” to determine the acoustics of a room, this could very well represent a practical way for consumers to analyze marijuana similar to how we appreciate wine. As technology becomes cheaper and more integrated and marijuana use becomes more mainstream, we’re bound to see even more advancements in vapor technology. Until then, there are plenty of comprehensive options available to even the most discerning smoker… combustion is so 2000’s!